> Below is the first in a new summer sermon series at RUMC entitled: “Creo / I believe: What Christians Believe and Why it Matters” that will walk through the clauses of the Apostles’ Creed. The lectionary complied for this series can be found here, in a previous blog post. Creo / I believe – ancient words – ancient questions. What does it mean today to say the word(s) Creo or I believe? What should follow such words? I heard someone use them this past week in a rather casual way about the weather when they said: “I believe it is going to rain later today.” In that instance, the words had nothing to do with religion or faith. It is a way of saying “there is a strong probability it will rain later today.” “I believe” is sometimes followed by a guess, or a hypothesis: “I believe that my sister will be dropping by the house sometime this week.” Here the words express a hope or a possibility. The grammar here is more like the grammar that my wife and I used on May 14, 1988 when we stood before the altar of a church in Oklahoma City and said: “I promise to love you in sickness and in health; in good times and in bad … until death do us part.” The words were deeply personal, but they were also tried and true vows that have been used by countless couples that had preceded us in this challenging, difficult, and joy-filled journey called marriage. When we stand to say the creed, it is the same. “I believe” is more akin to “I promise.” Words that are deeply personal but also vitally corporate and communal – always implying love and relationship. When I counsel couples for marriage, I encourage them to use the traditional vows of the church; not because I discourage them from writing vows or extra words of their own that they may want to share – which they often add to part of the ceremony – but I encourage new vows or promises to be used in addition to the traditional ones. It is understandable that couples feel compelled to find their own words of promise and love, and I encourage them to do so, but these traditional vows are also important precisely because they are time-tested, tried and true words – vows that have been put the test by countless couples who have gone before; couples who have seen sickness, death, poverty, and untold trials and challenges; couples who have found these words of promise and commitment not limiting, old, dusty, or boring – but rather a solid, enduring, deep, and abiding foundation under their feet when trails and tribulations came their way. The Apostle’s Creed is like that. It is more a pledge of allegiance and a promise of devotion than it is a set of propositions to be believed in or not. The creed is a pledge of allegiance – have you thought of the creed in that way? Maybe we would prefer to keep the creed as a summary of faith or doctrine rather than a promise of our devotion, trust, and full surrender. The creed as pledge makes these words disturbing and subversive. These words have a way of reminding us that nothing and no one should be allowed to take precedence over this God. “So go ahead,” says this God, “go ahead and make promises to your spouse in marriage, but don’t ever let your love for her or him trump your love and devotion for me who once said: “unless you hate your father, your mother, or your sister you cannot be my disciple.” “So go ahead and stand for your own nation’s pledge of allegiance, to a flag or leader, a president, king, or queen, but be fore-warned ahead of time of the words of my prophet Jeremiah: Cursed are those who trust in mere mortals … whose hearts turn away from the Lord. They shall be like a shrub in the desert, and shall not see when relief comes. Church, have no doubt. When we stand to recite the words of this creed, just like the couple who stands before the altar to take marriage vows – we say more than we know – we pledge more than we imagine – we commit to more than we can currently fathom. Just as a couple has to spend the rest of their lives trying to live into the words “I do” – so the church strives to grow daily into the bold and daring words of our confession: “I believe.” We stand up and say those words not because we have all our theological ducks in a row; not because we have no doubts about our faith; not because we have no anxiety about the future; not because we have no pressing questions about suffering, pain, evil, or spirituality – but because we are in love with the greatest Lover of our souls; because we are drawn to God’s love, and we are committed to exploring that love every day, trusting in it more every week, resting it in more fully through every trial, and growing into it as we seek to love God and our neighbor in return. Yes, I am convinced that the creed can and should be described as a pledge of allegiance, of devotion, of trust – ultimately, of love. 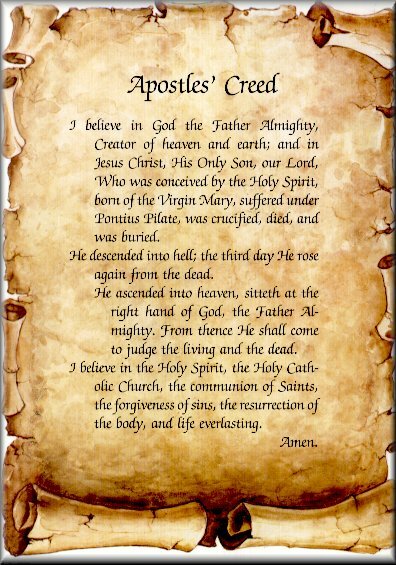 The Apostles’ Creed is not only a pledge of allegiance; it is also a subversive story. Take a close look at the creed and you will discover that it is not and has never been merely a set of propositions to agree with or not. It is a story; a story that flows from God to us and not the other way around. It is called revelation. We know God because God chose to reveal God-self to us. This is a story that starts with God the Father Almighty, maker of heaven and earth, not with “me, myself, and I.” We don’t stand in worship to say: “I believe in myself, my ability to discern all things spiritual. I believe in my own personal quest for truth and meaning. I believe that I should not be encumbered with old dogmas, with other people’s beliefs, or with outdated and outmoded ways of thinking and believing. I believe that every person can discover what is true for themselves.” The creed is a summary, a cliff notes version, a kind of “table of contents” to the grand story of salvation history contained in the Old and New Testaments. It is a story that challenges our modern culture, with its rampant individualism and self-proclaimed trust in human ability and intellect. I have heard people say that they have difficulty saying the words of the creed. They have problems with parts of it; they disbelieve certain clauses or desire or think that creeds feel too oppressive to them. They want to be free to think and let think; to come up with their own answers; to find themselves and their spiritual journeys without being bogged down with old dogma. I have to be honest. I don’t understand such thinking myself. I love the fact that I stand to say more than I know. I love to stand up and confess faith in a world that is bigger than I am, that stands on the shoulders of thousands of saints who have gone before me, and who have found these words to be words worth fighting for, words worth living into, and words worth dying for. The creed is a pledge. The creed is a story. It is also fence. One of my favorite gospel songs is “Jesus, be a fence all around me every day. I’m asking you to protect me as I travel along the way.” The creed is a summary of the church’s sound teaching and good teaching that is spoken of in today’s epistle: For I know the one in whom I have put my trust, and I am sure that he is able to guard until that day what I have entrusted to him. Hold to the standard of sound teaching that you have heard … guard the good treasure entrusted to you, with the help of the Holy Spirit. Why do we say the creed so often in worship? Because it is like a fence, a fence that holds us to the standard of sound teaching that has been delivered to us from the first apostles’ down to today; because it is a fence that holds us in front of Jesus. Why should we care about some words that have been around for so many years? Because we care about truth and because these words point to the good treasure of God’s gospel which we are called to continue to proclaim, share, and confess with the help of the Holy Spirit. Do you have questions about the world or doubts related to your faith? Then stand and say the creed knowing that it like a protective nursery, safe enough to contain your doubts and big enough to expand with you as you grow. Do you think the creed is a boring set of dogmas that are old and irrelevant to your life? Then I challenge you to say it anyway. You may discover it is quite the opposite – that it is too exciting, too dangerous, and too threatening to say it on a regular basis. You may discover that the danger here is not that these words are boring but that these words can get you killed. Do you want to leave the small world of your own thoughts, desires, and knowledge and enter into the large, grand world of God’s salvation story? Then jump into this creed with both feet and walk together with other believers on a journey that will not only change your life, but heaven and earth as we know it.